The area of Cabo Roig on the Orihuela Costa is popular for it's beaches, restaurants and bars and is only 5 minutes from 3 Championship Golf Courses, 20 minutes from Murcia airport or 40 minutes from Alicante and 10 minutes drive to Torrevieja on the Costa Blanca coast. There is a local bus service which regularly runs along the N332 to Torrevieja and Cartagena. This fully furnished, three bedroom, two bathroom luxury home is superbly located extremely close to the beaches, golf courses, shops, bars and restaurants and sleeps up to 8 people. 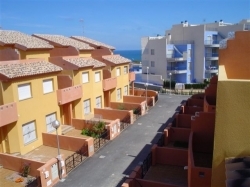 It is located in a brand new development in a quiet street next to the prestigious Cabo Roig sea front. 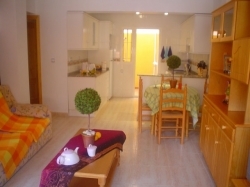 The villa has one double bedroom and two twin bedrooms all fitted with comfortable beds and modern built-in wardrobes. 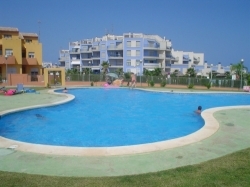 There is a large community swimming pool which is available free of charge to all guests. The spacious roof top solarium is also available for you if you just want to relax and soak up all that sunshine and can be used as a large BBQ area during the evenings. On the first floor you have your own private balcony, whilst at the front of the villa there is a patio area where you can sit and watch the world go by. The modern, fully equipped kitchen provides you with everything you will need to serve up your holiday meals, snacks and drinks. There is a cooker, hob, fridge freezer, microwave, washing machine, toaster, kettle, iron,and ironing board. Both bathrooms are fully tiled and have a bath, shower, toilet, sink and bidet. The living room is light, airy and spacious with English satellite TV and DVD player with a selection of books, games and DVD's. This room can also conveniently convert into an extra sleeping area with 2 fold-down double sofa-beds for bigger parties. You will arrive at a tidy, professionally cleaned holiday home which will have freshly made up rooms all with extra sets of linen for your needs and convenience. The villa is protected by high quality security locks to all doors and windows thereby offering you a safe shelter for your personal possessions. There is space available to park your car off-road in the front garden of the villa. NO SMOKING IS PERMITTED INSIDE THE PROPERTY.